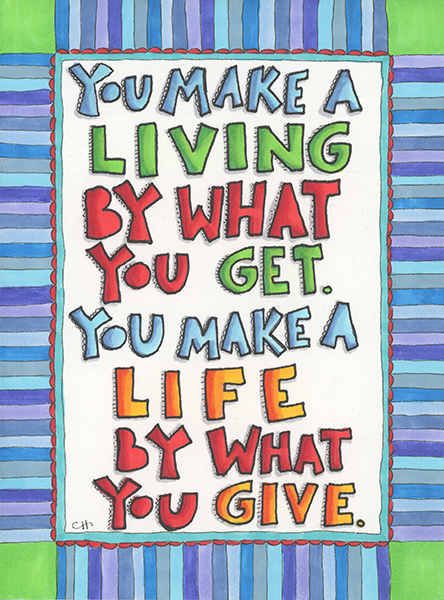 I sent this illustrated quote off to Brian Root. Brian and I have never met in person but through the magic of the internet and social media, I have watched him shine in his part of the world. Brian works in higher education at the University of Pittsburgh at Greenburgh in Pennsylvania in Housing and Residence Life. I decided to draw this quote for Brian because I saw it in one of his Instagram photos written on some wood in red marker when they were building a home with Habitat of Humanity and I liked it. Brian is a positive force in this world and is making a real difference through his job and his contribution to causes like Habitat of Humanity. 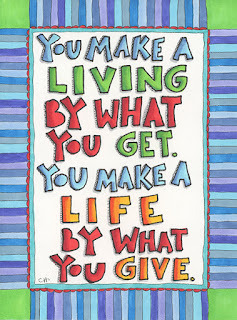 And isn't this quote so true? This world is a richer place because of you, Brian! Thank you for giving so much to it and to the people around you. 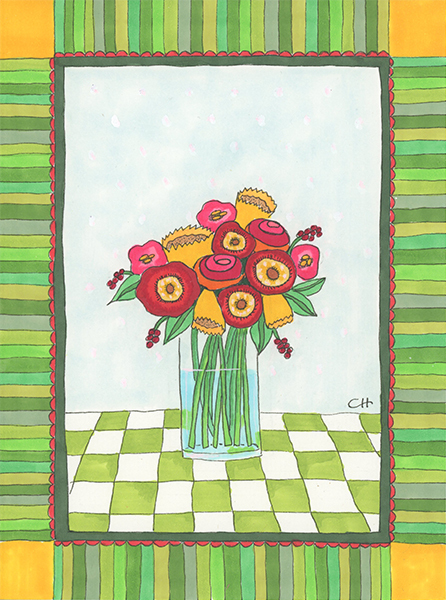 I knew from the beginning of Give 52 I wanted to send a piece of artwork to author, Elizabeth Gilbert. But what? 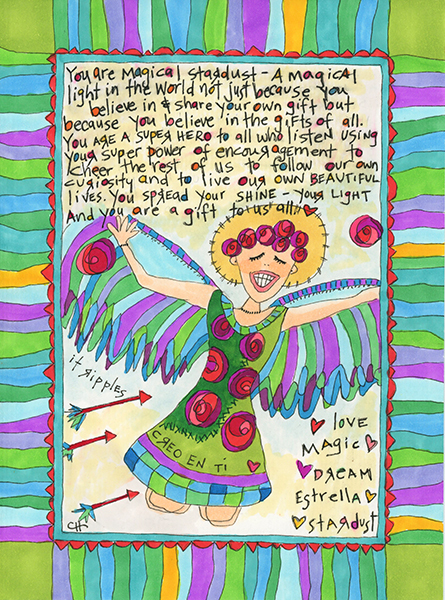 What do you send the person that is so magical that every time you hear her speak you think she's speaking directly to you? I can't decide if this drawing is a hit or a miss. It's not my usual style and while I have been influenced by Jean-Michel Basquiat lately, this is no where as cool as his crazy, bizarre and wonderful drawings but it is mine and it comes from my heart. Like most people, I first discovered Ms. Gilbert through her book, Eat, Pray, Love which I loved. Then, I listened to her TedTalk about your creative genius and it gave me courage to pursue my art further. Then, in 2014 I saw her in a 4:47 clip from Oprah's Live the Life you Want weekend tour where she spoke about following your curiosity when you don't know what your passion is. It was a freeing moment for me. I named 2015 my Year of Curiosity and in that year it led me to my passion and my purpose which I knew all along but I realized was I wasn't nurturing it. I read her book Big Magic in the fall. More nurturing of this artist life that I want to live. On the last day of my Year of Curiosity, I was scrolling through Facebook where I saw a posting of Ms. Gilbert's talk titled The Flight of the Hummingbird. I can't even summarize for you with any justice. All I can say is: WOW! This woman has a magical window into the soul of my life and every time I hear her, it's exactly what I need to hear. I know I'm not alone in this feeling. She is a Super Hero to so many women out there. She brings light to the world. Serious girl crush going on here. I'm beyond excited to see her speak in May in Dallas! Can't wait. Update: This is me not being brave. I love the above piece that I'm still in possession of but will be mailing off today. I say it's me not being brave because I'm including an additional flower piece. Because it's not my normal style and maybe I'm afraid she won't like it and I want her to have something that I think she will like but I don't really know Liz Gilbert so how do I know what she's going to like! No matter. I've decided. She gets 2 pieces because I'm not brave and because I want to. There. The end. My decision. Don't judge me! The memories I have of me and my cousin, Julie growing up together are priceless. Julie is a couple years younger than me and as girls we spent a lot of time together. I loved the holidays when her and her family would travel from the Houston area to my grandparents house. I had a perfectly good bed at home but I wouldn't be happy unless I got to stay with my cousins at my grandparents house. And when they went over to their other grandparents house a town away, I was lucky enough to get to go with them. As we grew into teens, when Julie was in town we would hit the streets and drive and drive and drive. There wasn't texting or email when we grew up! We had to use snail mail! Gasp! I would go and stay with her and her family for a week in the summer and we would go play putt putt golf and go to the movies and to Astro World. Julie has had an interesting life. Her and her husband lived in Santiago, Chile for several years. All but her first born were born in Chile. They were there on a Christian Mission. Her family is amazing. Julie lives about an hour away from me now and my hope is that we can get together this coming summer around the pool with all the kids. Come to Euless, Julie! 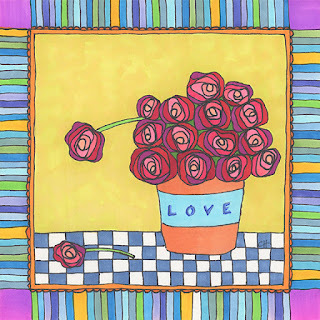 I wanted to send Julie a piece of artwork because of the beautiful influence she has had on my life. How did Wednesday get here so fast? Faster and faster the days go! And, I feel bad that my post wasn't up this morning, but life happens and I cannot sweat the small stuff. 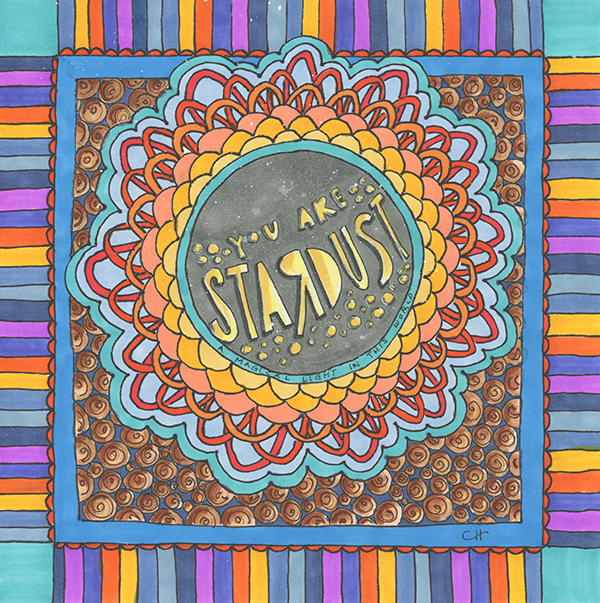 This stardust piece is making it's way to my online art teacher, Carla Sonheim. I took her art class in 2015, The Year of the Spark. So much fun and my new journaling style was born from her teaching. I love these books I'm creating. This Friday, the 2016 class starts: Y is for Yellow and I can't wait! This years focus is building a body of work which I'm kind of already doing through this very project of Give 52 but her classes are just so much fun and inspiring that I wouldn't miss it. 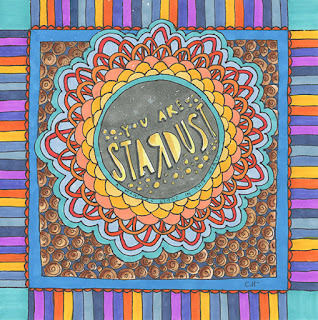 I'm not sure where I heard or read this saying about stardust but the piece says, "You are stardust. 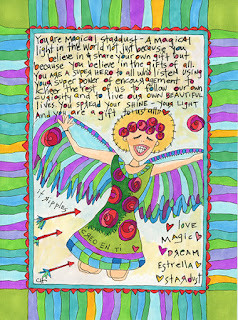 A magical light in this world." And, I love that saying. I want to be stardust! I know I have been falling super short of being any kind of light lately. At my paying job, I've been snarky and short and basically carrying around a big, bad attitude but I really want to be stardust. If you are interested in exploring your creative side you should totally look up Carla's classes. I love her style of teaching and she's an amazingly genuine person.